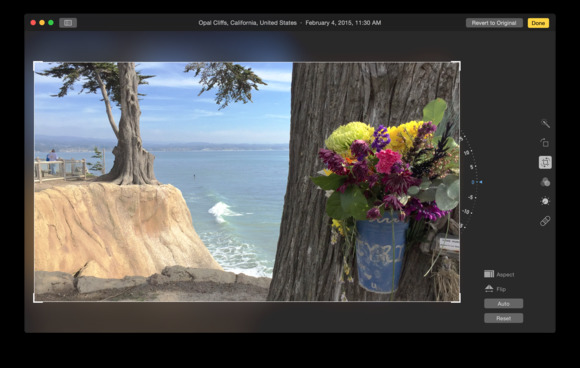 It seems that even after you offer a first look at Photos, suggestions for ways to prepare your iPhoto library for Photos, yap about Photos in a podcast, and field a number of Photos questions, people have more on their minds. Let’s get to it. A number of us probably have multiple libraries to minimize the iPhoto slow-downs. If what I read about Photos is correct, it will alleviate much of that sluggishness and allow working with much larger libraries. What is (are) the best way(s) of combining the individual libraries in order to have one consolidated library for use with the new app? You can certainly copy images out of one library and into another, but that’s not the same thing as combining multiple libraries as you lose album associations and so on. In a case like this I would turn to a tool designed for such a task—Fat Cat Software’s $30 iPhoto Library Manager. Among its many talents is the ability to merge iPhoto libraries. You can use iPhoto Library Manager to merge multiple iPhoto libraries. I have used iPhoto’s Events to construct many (hundreds) of scanned/restored photos (plus digital photos) by date and year, dating back to the 1800s. Will Photos respect this organization with its version of events? Will there still be the ability to batch change the dates so that scanned photos flow in date order? As I’ve explained elsewhere, Photos doesn’t have events. Rather, imported events appear as albums. Despite the new name, Photos will indeed support the previous organizational scheme. When you double-click on the iPhone Events album you’ll see collections of images, gathered together by date. And yes, you can batch change dates. Just select the images you want to edit and choose Image > Adjust Date and Time. In the resulting sheet you can change the date, time, and time zone. When you export those images to other apps, those time changes will be respected. Yes, batch changing date and time is supported in Photos. I believe at the keynote Apple said that Photos would allow third party plugins, have we seen anything of this yet? We have not, though you’re correct that Apple has said that Photos would be open to third-party extensions. Should this come to pass, some people’s complaints about the lack of truly professional features may be addressed. Can faces be moved over from Aperture and continued in Photos? We have years of grandkids’ faces we view as precious time lapse. They can. When you import an Aperture library face identification information comes along for the ride. When you select Faces either in the toolbar or sidebar, you’ll see any faces you’ve tagged. You won't lose face(s) when importing an Aperture library. Once all my photos have been copied over to the new app Photos can I then delete the iPhoto library and not lose any photos? I tested this by importing an iPhoto library, which created a Photos library. I then deleted the iPhoto library and, sure enough, the images remained. I’ve read a couple of your columns about the beta version but it’s not clear to me whether or not one has to store their photos in iCloud. I do not want to do this and want to keep them stored locally on my Mac. Is this going to be possible? Yes. As I spelled out in my first look, you needn’t use iCloud at all. You can store all your images locally. Or you can choose to continue using Photo Stream, which shares your images with other devices linked to your Apple ID, but not also use iCloud Photo Library. If you disable the iCloud Photo Library option, your images will not be stored on the cloud. Have questions of your own? Drop a line to mac911@macworld.com.